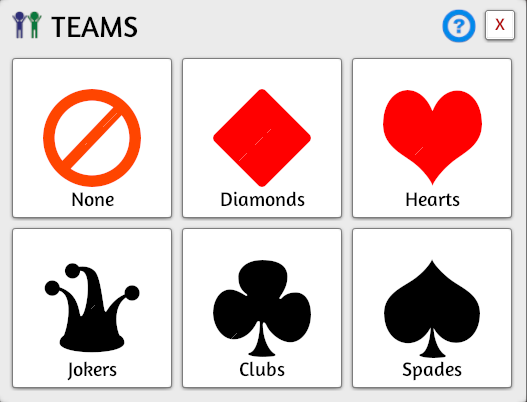 Teams are needed in a lot of games, so you can be split up into a max of 4 different teams: Hearts, Clubs, Spades, and Diamonds. To select or change your team, click on your name on the top right and then choose Change Team. Then choose which team you’d like to join. The team you join will show that symbol next to your name. So if you joined Team Hearts, then the heart symbol would be shown next to your name like the image below. You can leave a team by clicking the None button on the Teams menu. Players on the same team can see each other’s private info like Card Hands, Hidden Zones and the Notebook. To communicate, you can talk privately in voice chat, by pressing the V key for Team Voice Chat. You can also click on the Team tab that shows up once you join a team and chat privately with your team in that tab. If you are the host, you can change a player’s team by clicking their name on the top right and move them to another team if necessary.